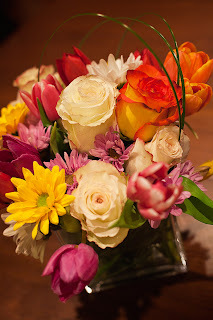 Sarasota Massage - Mending Hands - Melissa Finley - SRQ 34239: Bouquet of the Day! This week's bouquet from Hibiscus Flowershop is ringing in Spring for Mending Hands clients! Not only that, Mending Hands and Hibiscus Flowershop are pairing up for the celebration of Brooklyn Moms! This Mother's day - if you buy your favorite mom a Mending Hands Gift Certificate you will be eligible for an exclusive discount at Hibiscus Flowershop! Celebrate mom with 10% off your Hibiscus purchase of $30 or more. Feel free to email for more details on how to make your mom feel relaxed and loved this Mother's Day! Anatomy In Motion is Going Universal!